Hotel San Antonio's Dining Room is especially prepared for celebration banquets for events such as weddings, holy communions. Hotel San Antonio's Dining Room has a wide gastronomic offer a la carte. The Hotel has a Café where you can enjoy some tapas, snacks, combined dishes, drinks and refreshments. 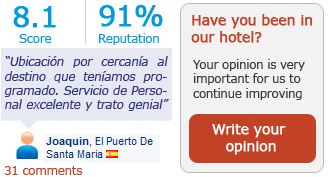 Hotel San Antonio is a 4 star hotel with, privileged location right in the Heart of Albacete. It is close to the Teatro Circo, the Town Hall, the Town Council, the Court House, the Delegations…. Hotel which is functional, comfortable and quiet. It has Free Wi-Fi, private car park, large bedrooms, meeting and banquet rooms, restaurant and café. Hotel San Antonio is ideal for Business Stays, as it has Meeting Rooms with free Wi-Fi and is situated in the financial centre of Albacete. Perfect accommodation for groups and Theatre Companies acting in the Teatro Circo. Special prices for groups. Comfortable hotel for your Holidays allowing you to get to know the city of Albacete without having to use transport. The Hotel has a Restaurant and a Café where you can enjoy the most delicious traditional, national and international dishes. We have banquet rooms which are ideal for celebrating weddings, holy communions, baptisms or any other event. We have rooms which are ideal for meetings and conferences and fitted with free Wi-Fi. Take advantage of your stay to do business. For our privileged location in the heart of Albacete. For our spacious totally fitted bedrooms. Because we have Free Wi-Fi throughout the hotel. For being a 4 star hotel with the best price/quality. Because we provide you with a totally prepared professional team. 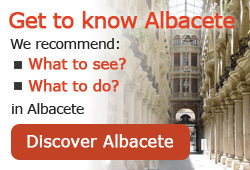 What to see in Albacete?